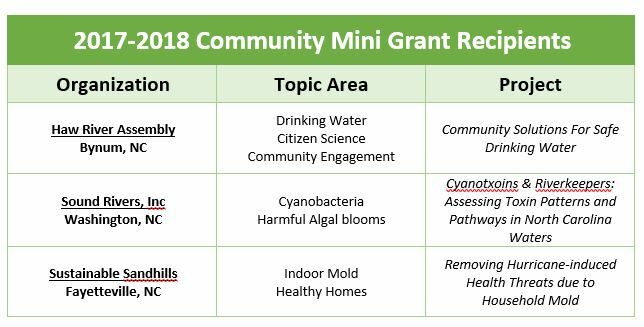 This month, the COEC selected the next round of Community Mini Grant recipients. Sound Rivers, The Haw River Assembly, and Sustainable Sandhills will each receive $8,000 to address local environmental health issues in year-long projects. Topics include harmful algal blooms, drinking water contamination, Hurricane Matthew remediation, and household mold. The grantees were among 28 impressive applicants from across North Carolina that applied for funding from CHHE. Click here to learn more about our Community Mini Grant Program!